The Bond-ettes mini set features a spectrum of light to dark shimmers: GoldenEye, The Spy Who Loved Me, Live and Let Die, and The World is Not Enough. The Top Ten Mini Kit includes some of OPI’s most well-known colors: Alpine Snow, Bubble Bath, Tickle Me France-y, Kiss Me On My Tulips, Red Lights Ahead…Where?, Big Apple Red, I’m Not Really a Waitress, You Don’t Know Jacques!, Vampsterdam, and Lincoln Park After Dark. 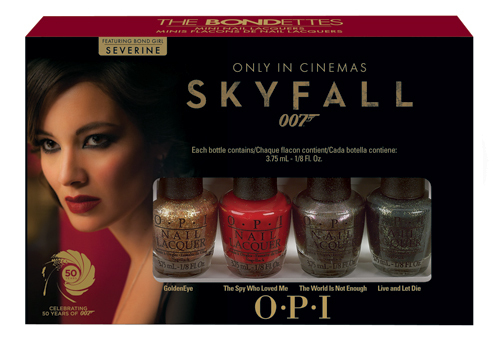 The Skyfall package looks lovely!